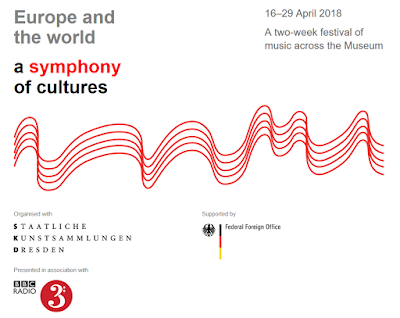 The British Museum is holding a music festival, Europe and the world: a symphony of cultures which will open up the museum's galleries to a whole range of concerts between 16 and 29 April 2018. Whilst some of the events are evening ones when the museum is closed, many are daytime events intended to interact with the museum visitors. The festival is the brainchild of Hartwig Fischer, director of the British Museum, and Daniel Kühnel, artistic director of the festival and intendant of the Hamburg Symphony. The festival is not intended to turn the museum's rooms into concert halls, but to encourage the public to ask questions about their interactions with the museum's exhibits, between the different areas of the collection in the museum. The festival's theme is Europe's connection with the world and vice versa. Various venues around the museum will be used including the reading room, the Parthenon galleries and the Egyptian galleries. The programmes are intended to create encounters between cultures and between moments in history. The opening night, which takes place on 16 April in the Parthenon Gallery, will combine Richard Strauss's Metamorphosen, his lament for the destruction of European culture, with Berio's Recital for Cathy which Kühnel sees as asking questions about what art can be and what does culture mean, and Scelsi's Xnoybis with its meditation on Buddhist thought and culture. The final concert which takes place in the Reading Room, combines Bartok, Nono and Hosokawa, again works which reflect and refract ideas about European and other cultures. A more intriguing encounter takes place in the Egyptian galleries on Wed 18 April 2018, when there will be performances of gagaku, Japanese classical music. Not an obvious combination, but Kühnel sees the Japanese music as formal, rigid and spiritual and feels that the encounter with the similarly rigid Egyptian culture (both ancient and both foreign to us), will prove enlightening. There is more Oriental music when Zhang Jun brings Chinese kungqu opera to the museum on Friday 20 April, but the performance will be an interesting encounter as Zhang Jun will be performing a 75 minute, one-man version of Shakespeare's Hamlet. There is something refreshingly conceptual about the idea behind the festival, it is intended to make the listeners ask questions rather than providing answers and it is certainly a long way from the sort of festival which makes a museum simply a nice backdrop for the music. It is the third such festival that Kühnel has organised, the first in 2015 was with Fischer in Dresden (where Fischer was based before he came to the British Museum) and the second in Jerusalem. In each case, the festival explores new ways of interacting with what Ficher calls encyclopedic museums.One interesting aspect to the experience is that both Kühnel and Fischer feel that having immersive, interactive music will make listeners think more about the experience with the objects in the museum which are behind glass and no longer interactive. Of course, quite what the average museum-goer will make of wandering into a gallery to find Scelsi piano music or Byzantine chant playing is anyone's guess, but that is part of the festival's charm. Full details from the British Museum website.